The Rights and Resources Initiative (RRI), a global coalition of more than 200 organizations dedicated to advancing the forestland and resource rights of indigenous peoples, local communities, and rural women, has said in statement issued from Washington DC that evicting millions of indigenous and local peoples from their forest homes – as ordered by Indian Supreme Court – might prove to be “highly detrimental to conservation in India”. The Indian Supreme Court decision in February to remove millions of forest-dwelling people in five months will not only have devastating human rights implications but also hurt the global struggle to save forests and mitigate climate change, according to numerous experts. Even though implementation of the decision has been placed on hold until July, the homes of millions remain under threat. The landmark Forest Rights Act of 2006 recognized the rights of communities in India to own and manage their forests, laying the groundwork for recognition of at least 34.6 million hectares of land for 150 million people – yet barely 10 percent of that potential has been realized. National wildlife conservation groups brought a petition to the Supreme Court seeking to invalidate the Act, claiming this was necessary to protect wildlife and forests. On February 20, the Supreme Court ordered the time-bound eviction of 1.1 million families whose claims under the Forest Rights Act had been rejected by the authorities. The ruling could affect at least 10 million people directly, and persuade tens of millions more not to apply for their rights under the Act. Although the Supreme Court has put a temporary stay on the evictions, millions of peoples’ lives have been thrown into limbo by the court decision. Although only a small percentage of the FRA’s potential has been realized, there is growing evidence that where rights are recognized, Indigenous Peoples and local communities are conserving India’s precious forests and biodiversity and opposing destructive extraction projects. Indeed, while many conservation areas in India are established to protect tigers, research shows that the presence of Indigenous Peoples can actually improve tiger populations. “The FRA also represents a core strategy for mitigating climate change and meeting India’s commitments under the Paris Agreement, as community rights recognition under the FRA has already led to an upsurge in community-led conservation and restoration of forests,” said RRI’s Asia Director Kundan Kumar, citing the Centre for Science and the Environment’s publication “People’s Forest” as an example of documentation of such efforts . “For generations, India’s tribal peoples have lived in harmony with the country’s wildlife, protecting and managing vital natural resources. 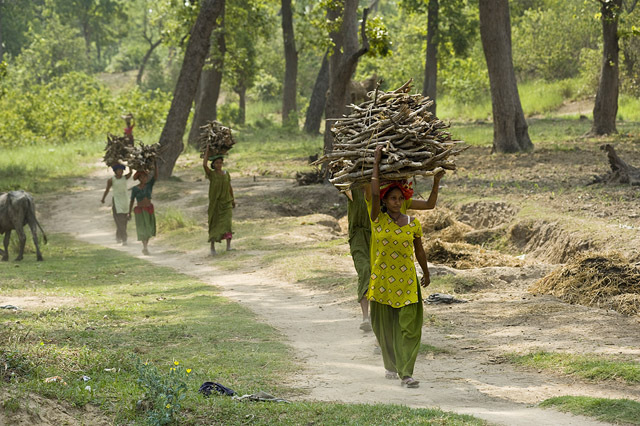 It is because of their sustainable stewardship that India still has forests worth conserving. To truly protect wildlife, recognizing the rights of forest guardians would be a far more effective strategy than rendering them homeless,” added Tauli-Corpuz. Insecure land rights have already led to significant conflicts in the country: an analysis of 289 land-related conflicts in India in 2015 found that these conflicts have impacted 3.2 million people and put at risk investments worth over US$179 billion. Where Indigenous Peoples and local communities have secure rights, deforestation rates are lower and carbon storage higher. This critical contribution is recognized by major conservation organizations such as the International Union for Conservation of Nature (IUCN). IUCN’s Standard on Indigenous Peoples endorse the concept that communities must give consent for any projects on their lands and cannot be forcibly relocated. Yet Indigenous Peoples and local communities only have secure legal ownership rights to 10 percent of the world’s land, despite have customary rights to at least 50 percent. This gap drives human rights violations, food insecurity, and the destruction of local livelihoods and cultures. “The conservation justification for this ruling is colonial and shocking to witness in this day and age, especially in the world’s largest democracy. The Modi government needs to either pass new legislation that alleviates the need for these evictions or petition the court to reverse its decision, and accelerate the recognition of tribal and scheduled caste community land rights across the country,” said RRI Coordinator Andy White.